This reminded me of the Japanese milk tea. 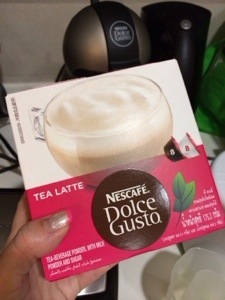 Being a non-coffee lover, I really liked the Dolce Gusto series. This was what I called a true blue ocean strategy because they created a product, typically known for coffee fans, for non-coffee drinkers. My favorite was Chococino because it actually tasted like the hot chocolate that I could get at Starbucks. Of all other flavours I had tried, tea latte must be my second most favorite. What an ideal machine to share since Mr H, the kopi drinker, was happy with the likes of cappuccino and mocha, and did not require fancier options.